This is my family’s pizza gana recipe! 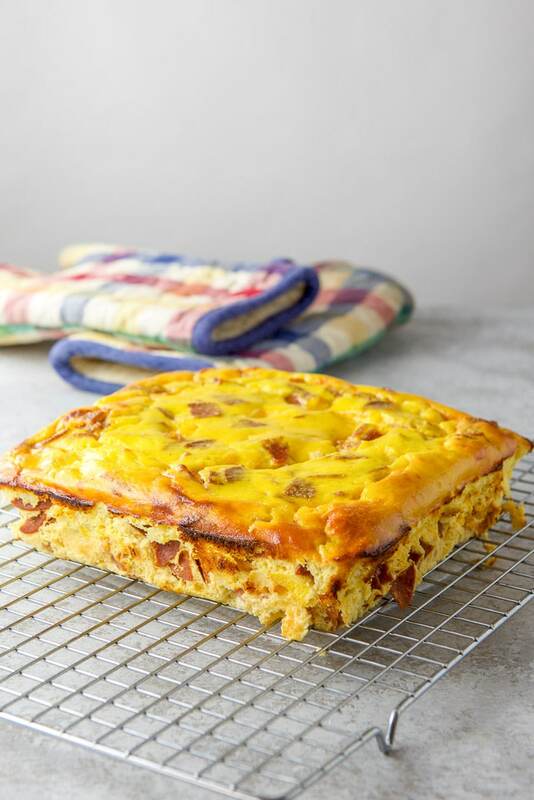 Pizza gana, if you are unfamiliar with it, is an Italian dish made with a combination of eggs, meats, cheese and a little milk. My family makes pizza gana every Easter. We usually have it for breakfast or with an assortment of appetizers mid-day. 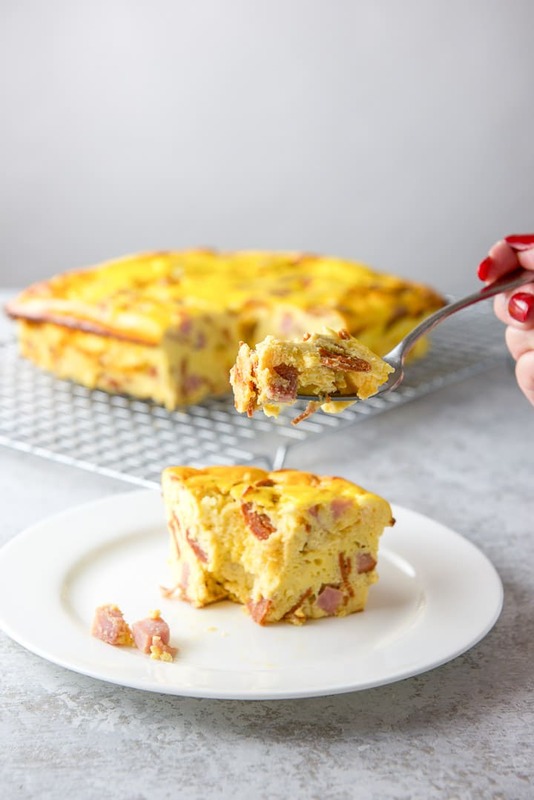 It’s my favorite egg casserole, by far. When I was in college, I would travel home for Easter. Afterwards, my mom sent me back to school with a slab of pizza gana that I would covet and make last as long as I could. I wouldn’t share it with anyone. Not even my best friend. Selfish, I know. But you would understand if you tasted pizza gana. If you had, you would have fist bumped me. There are a few ways I’ve seen this eggy dish spelled, this way and pizza gaina! How do you spell it? In this recipe, I use sliced pepperoni because I forgot to tell hubby to get the sausage stick when he toddled off to the store. If you get it in stick form, you can cut the pepperoni yourself into thicker slices or little chunks but even pre-sliced pepperoni needs to be cut. You can use leftover smoked shoulder or ham for the second meat. With this dish, you need to grease your pan really well AND liberally grease the wax paper you line the pan with. Trust me on this. The sides of the pizza gana WILL stick to the wax paper somewhat but just peel it away. Don’t stress when the browned sides pull away as it did with mine. That is normal. My recipe makes an 8 x 8 or 9 x 9 inch pan, so if you are serving this to a crowd, double it and use a 13 x 9 inch pan. Grease an 8 x 8 or 9 x 9 pan liberally with either butter or vegetable shortening. 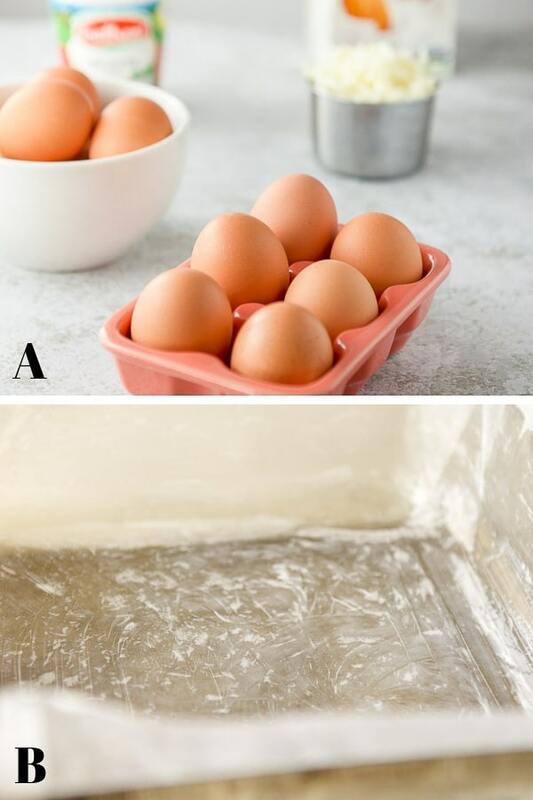 Take wax paper, press it fully into the greased pan and then grease the paper liberally as well. 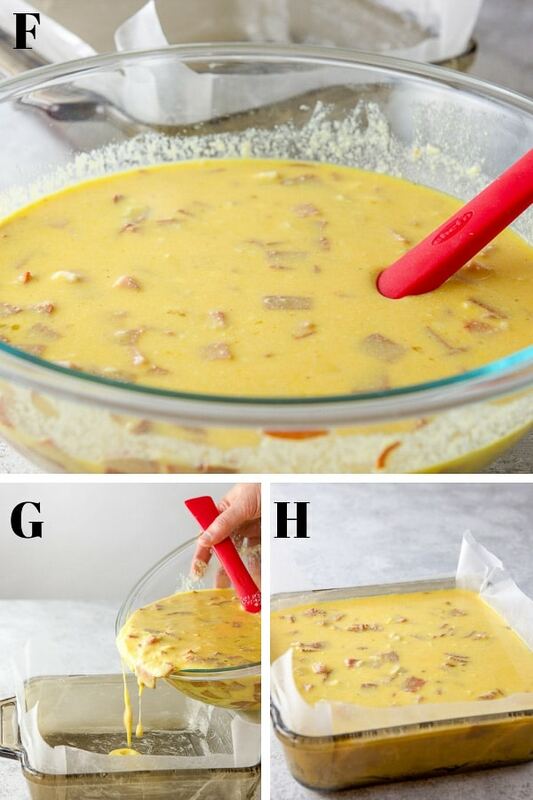 Place the baking dish in the oven and set the timer for 1 hour and 5 minutes. I start testing the pizza gana at an hour. I take a clean butter knife and stick it in the middle of the dish. You will know it is done when the knife comes out clean. It’s all fluffy and puffy. As it cools, it sinks a little. Let the pizza gana cool for 10 minutes before you take hold of the wax paper, lift the whole casserole out of your pan and place it onto a wire rack. My sister Robyn was at my house when I made this. She removed the wax paper for me. Robyn as my hand model. Mmm! Pizza gana is surprisingly moist. It’s also delicious and fun to eat. 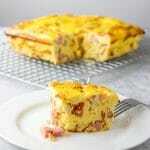 It’s similar to quiche, but firmer, with a different taste and mouth feel. And of course, no crust! Do you have an Easter tradition? Leave me a comment to tell me what it is as I’d love to know. If you’ve tried this Pizza Gana recipe, I’d love the know what you thought about it in the comments below. I love hearing from you! You can also FOLLOW ME on FACEBOOK, TWITTER, INSTAGRAM and PINTEREST to see more of my delicious food and delightful cocktails! 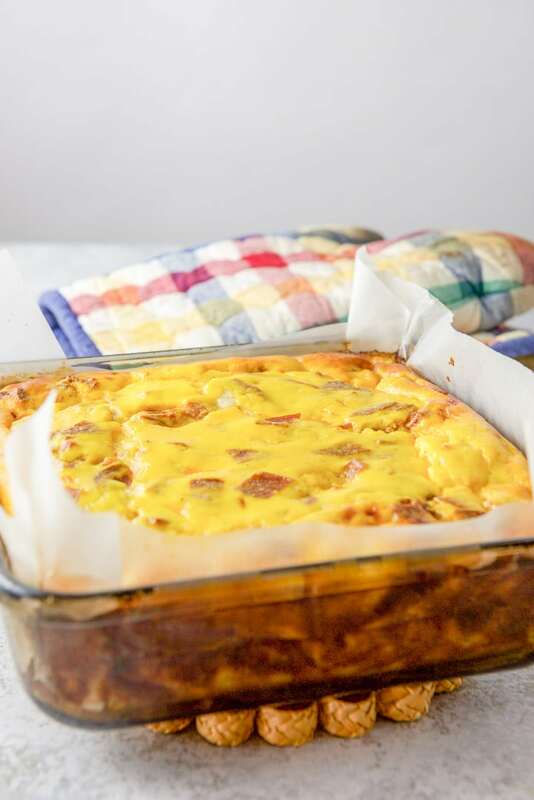 This egg casserole is so delicious and will become a family tradition any time of the year, and not just at easter! I can’t wait to try this recipe. I make a baked omelet, but the pizza part sounds fun! I have been using non-stick foil instead of parchment paper for a lot of recipes. No greasing necessary. I’m planning on making this on Easter, but I’ll probably double the recipe! Great! I hope you enjoy it Joyce! I love recipes that are multi-purpose. This fits the bill! You can eat this for breakfast, brunch and dinner. Take the leftovers for lunch too!! Cook once…eat LOTS! This looks so yummy. 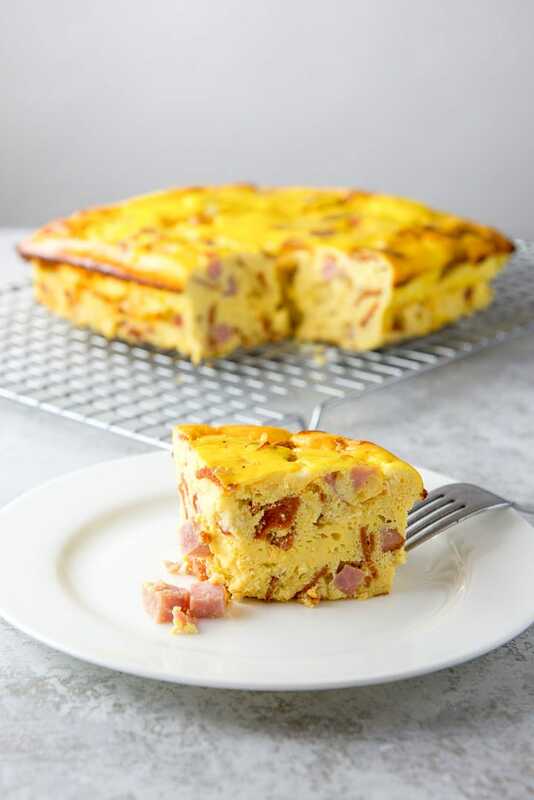 I haven’t heard of this egg dish, I am going to make this asap. It’s a fun and great way to have something different for brunch! Thanks, Luci! It is so fluffy!!! 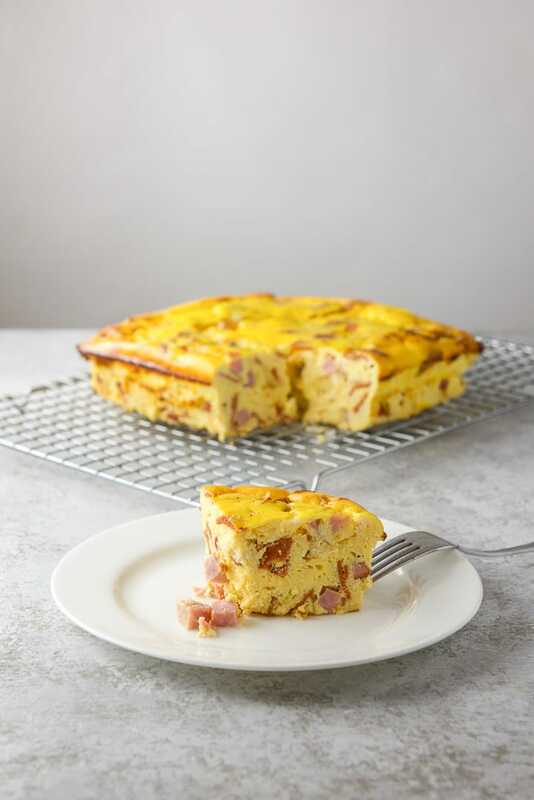 This is perfect for a weekend brunch or even just a family breakfast!!! Indeed! Thank you so much Tisha! That is one seriously gorgeous sounding recipe! Love your description of your husband tootling off to the shops too, lol! I’ll be trying this recipe this Easter season, thanks for the inspiration! Thanks Elizabeth! 🙂 It’s a fun dish that can be enjoyed for days. Unless you have a big crowd! Thanks Adrianne! It’s my favorite thing to eat around Easter! This pizza gana looks so good, makes for a yummy breakfast or snack, need to make it a.s.a.p.! Hehe! Thanks, Patty! I hope you enjoy it! I’ve never heard of this before, but it looks so delicious! Perfect for feeding a crowd, and I bet the left overs are super tasty too! I have never heard of this, but I think I will be making it to take to my sister’s on Easter! It’s so scrumptious and unique, Denise. I’m sure your sister will like it! I’ve never heard of this dish before! Sound delicious and perfect for entertaining! Thank you, Kathryn. Not many people have heard of it, but it’s a beloved dish for my family! This looks so good! I have had this before but never knew the name ! Now that I have this tasty recipe I’m going to have to make it 🙂 Thanks for sharing ! It’s so easy Veronika! Truly! I hope you enjoy it when you make it! Thanks, Jo! It’s so yummy! Everyone who’s had it, loves it. It’s moist and delicious! I’ve never heard of this before but I definitely want to eat it! Are there any suggestions for what you would serve with it? 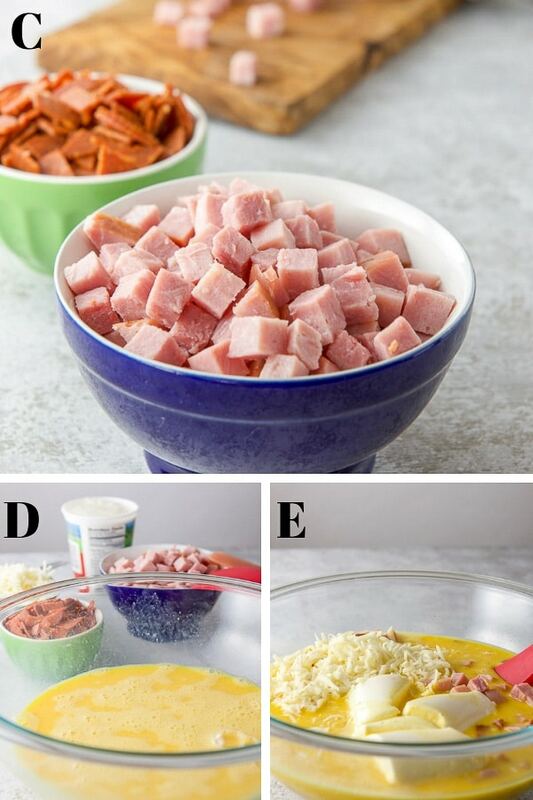 It sounds amazing for breakfast lunch or dinner! Great for brunch entertaining too. We always used to have it by itself for breakfast and on Easter, we’d have it with appetizers around lunch – like shrimp cocktail, cheese and crackers and such fare! Thanks for your comment, Laura! I’m sold! Never heard of pizza gana but that sunshine-y yellow and the texture is enough to make my mouth water at the prospect of eating it! Love the easy, detailed steps too.